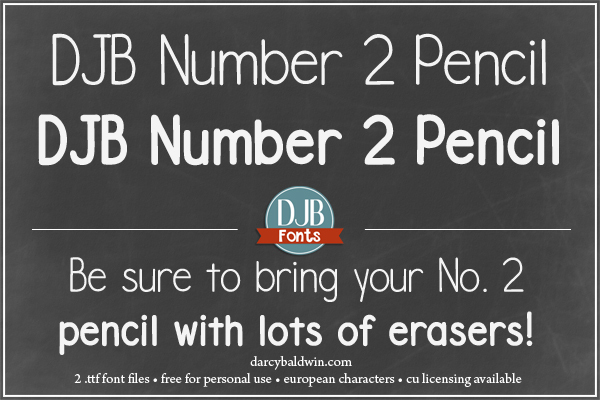 DJB Number 2 Pencil Fonts – Get out your number 2 pencils for a pop quiz!!! Don’t have one? Well, use this awesome font from DJB Fonts to create teacher classroom materials and other text that is easy to read without being run of the mill! This file contains two .ttf files with a full alphabet, numbers and punctuation, European language characters and two standardized testing bubbles. It is free for personal use (not-for-profit). If you have a question about what constitutes personal use, check out this info or contact me with questions.